Wonderful! densely populated golden healer burr cluster - reminds us of a pinecone - FULL of gently radiating energy, rising from a charcoal grey sandstone matrix . From the type locality for golden healers [in the WORLD], it's got clear crystals with iron inclusion [inside. won't clean off. 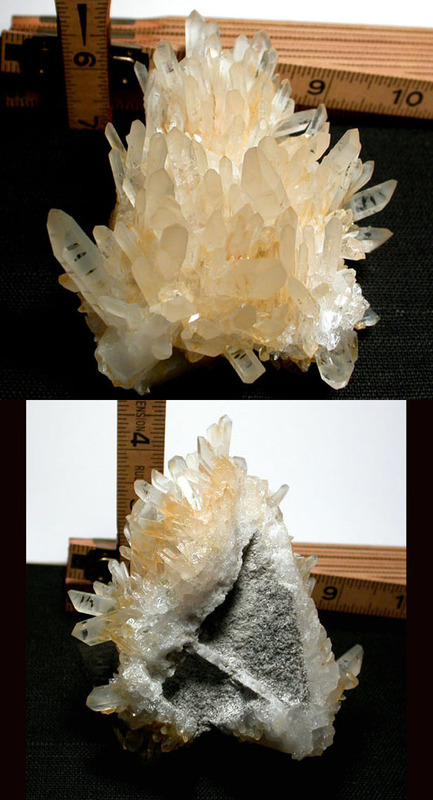 ], preferentially frosted crystals [finest thinnest second generation quartz!] - some with directional stripes and graphics! Needle crystals [rare], to 'regular' points of 3/4x 1-3/8" tall. Channel faced crystals, transmitters and twins, penetrators, and an uncommon 7h faced, too. A frill of extraction work has left a 1/2x 1" bright clear area which contrasts nicely. Overall this uncommon growth habit cluster's 2-3/4x 3-3/4x 4-1/2" long. Dramatic in the softest most suggestive way. 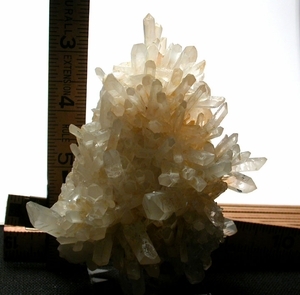 From Collier Creek Mine, Montgomery County, Arkansas for your one of kind collection, healing work and general joy.